This is yet another lovely aubergine (eggplant) recipe. 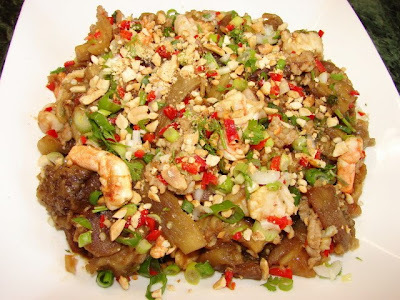 This is a Cambodian recipe. 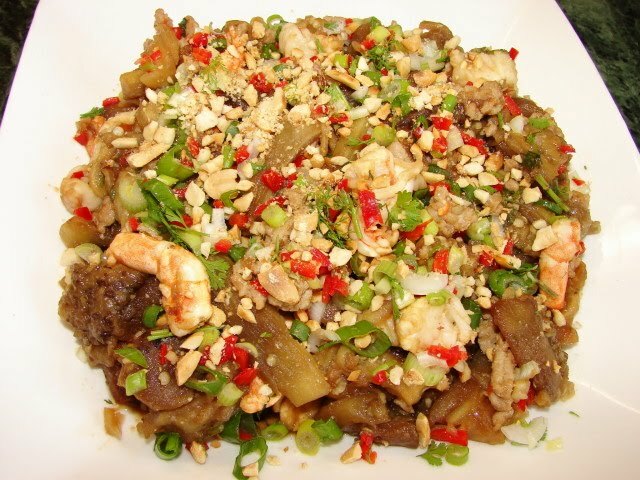 I don't know much about Cambodian cooking. I got this recipe from a friend. I like the way the aubergine is first chargrilled whole then shredded, the aubergine is sweet and has lovely smoky flavour. I don't have a charcoal grill. 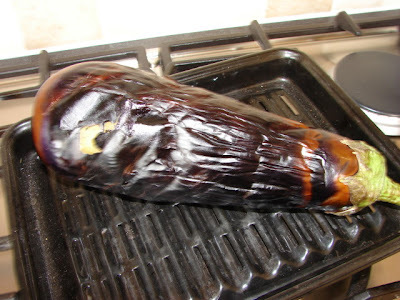 I chargrilled the aubergine with direct flame. 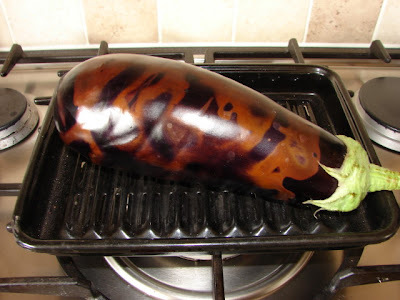 Chargrill the aubergine on direct flame. Low flame. I do have a perforated griller pan. 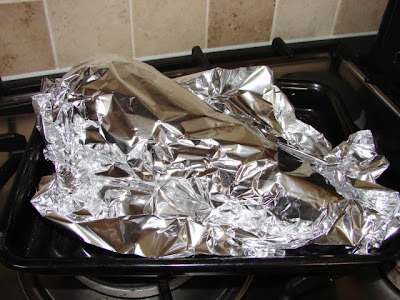 ** Can also roast the aubergine in the oven if not chargrilled. 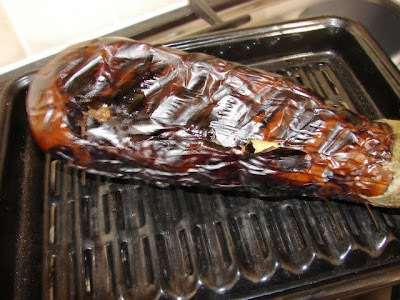 When aubergine turning soft and collapses somewhat, about 15 minutes. Test with skewer if it can piece through easily it's done. Don't cook till aubergine is mushy soft. Cover with foil and leave to cool. Peel the skin and shred the aubergine into pieces. The aubergine is now ready for the stir fry. about 500g (with stalk) fresh aubergine, 1 very large aubergine or 2 medium aubergines, chargrilled. peeled and shredded. Heat oil, stir fry garlic. 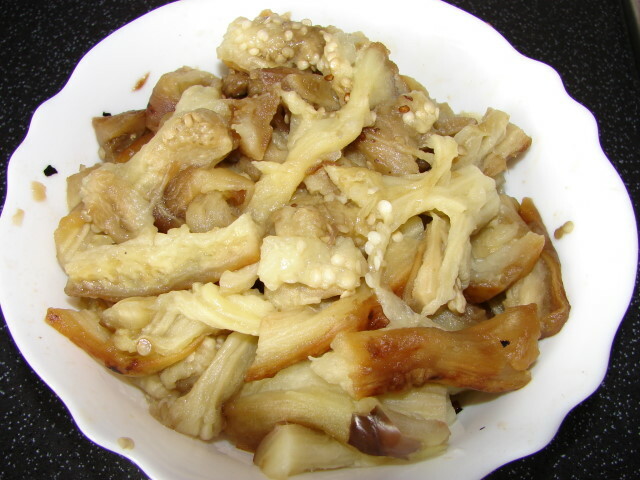 Add minced pork and fry till brown and any liquid from pork is drying. Add dash of fish sauce. Stir. Add prawns. Stir fry till prawns changed colour. Add aubergine. Stir fry till aubergine is heated through. Season with enough fish sauce, dash of dark soy (for colour) and little sugar to taste. Ready to plate up. Sprinkle on remaining spring onion, chilli and coriander. And finally some crushed peanuts. Very yummy and great to be served as a main or starter.